I discovered a variant of the lights-out puzzle which I find strangely addicting. The board is large (12 by 12). Pressing a light toggles it as well as its neighbors. On the N‘th level, the computer “presses” 4N lights at random. Your task is to undo the presses. It is an exercise in pattern matching. 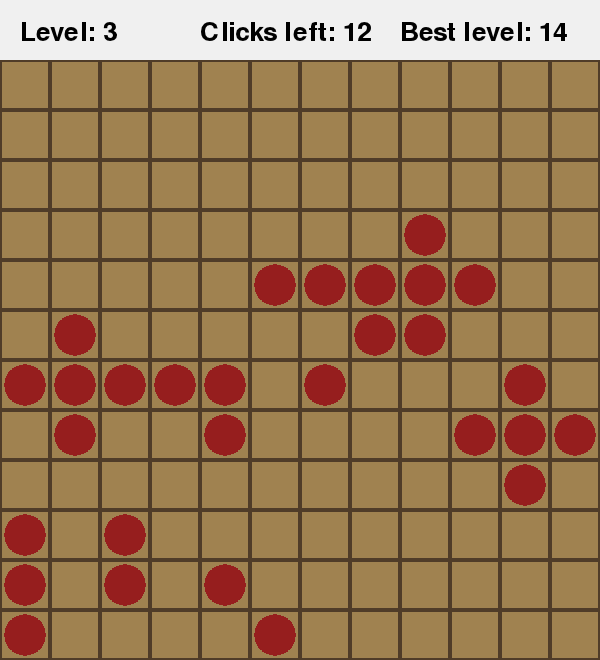 The task gets more difficult at later levels as the overlapping patterns begin to look random, but at the same time you have more clicks available because the computer may choose a location more than once (and pressing a light an even number of times is the same as not pressing it at all). If you learned to beat the game, you would be able to solve the 12x12 lights-out puzzle. Notice that the order of clicks is unimportant (the operation is commutative), and that clicking a location K times is the same as clicking it K%2 times. Thus a solution can be described by a bitmap over the board. A strangely addicting game, based on the Lights Out puzzle.